I am so happy that summer is coming to an end. Yes, summer is typically my favorite time of the year, but this summer has been brutal with high temps and INSANE humidity! I’m certainly ready for some coolers temps and I know my skin is too. I have dealt with battled oily skin on my face almost my entire life. And for the past several years almost all of my 20’s I was on the hunt for a product that wouldn’t make my face look greasy and shiny about 10 minutes after I stepped out of my house (and into the horrible swamp air of D.C.!). Well this summer, I finally found two products that work pretty well. The first I found through my fabulous Birchbox subscription: Stila’s One Step Bronze. This product will definitely stay a summer product since it is a bronzer and does add some color to my skin, but I liked the results. I put a thin coat of the One Step on under my foundation and applied the rest of my makeup as normal. It didn’t feel too cakey and helped keep the oil under control. Throughout the day I didn’t have to blot my skin/touch up my makeup near as much as normal. The second product I got for my birthday and I love it! 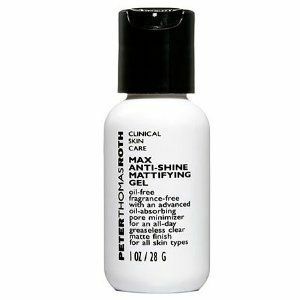 It is Peter Thomas Roth’s Anti-Shine Mattifying Gel (or as my Dad calls it “a De-Greaser”). This product I tried two ways; one day I put it on under my foundation and the next I put it on over my foundation. I prefer putting it on over the foundation, I found that my foundation smudged a bit if I already had the mattifying gel on my face, and applying it over my foundation helped to set everything. The mattifying gel is so light and makes my skin super smooth. My oily skin was also kept under control and I only had to touch up at the end of the day, not during. Both products definitely helped keep my face from looking like an oil slick by the end of the day, and weren’t too heavy. While I was happy with the results, I am still looking for a product that will keep me looking completely matte. Who knows if that product even exists for someone with super oily skin? I’m definitely keeping these two products in my beauty bag and I recommend you try them if you have the same problems as me. And if you found a product (foundation, powder, primer, whatever) that you love, feel free to share it in the comments section below. I got the stile one step via birchbox too! I'm too lazy to go through more than one coat of anything though so I just mix it in with a little tinted moisturizer. It does give a nice subtle glow. And speaking of tinted moisturizers those are my fav. I never wear foundation any more in favor of these and bit of mineral powder.